The annual meeting of the European Committee for Treatment and Research in Multiple Sclerosis (ECTRIMS) was held in Barcelona, Spain, on October 7-10, 2015, and boasted over 9000 attendees. While there were countess platform presentations and posters on multiple sclerosis (MS), this year's meeting will undoubtedly be remembered for the presentation of the phase 3 clinical trial data for ocrelizumab, which spanned two clinical trials and two forms of the disease. Ocrelizumab, an anti-CD20 monoclonal antibody that targets B-cell populations, is a humanized version of rituximab, an agent approved in other disease states that was shown to have efficacy in relapsing-remitting MS (RRMS) in a phase 2 trial. 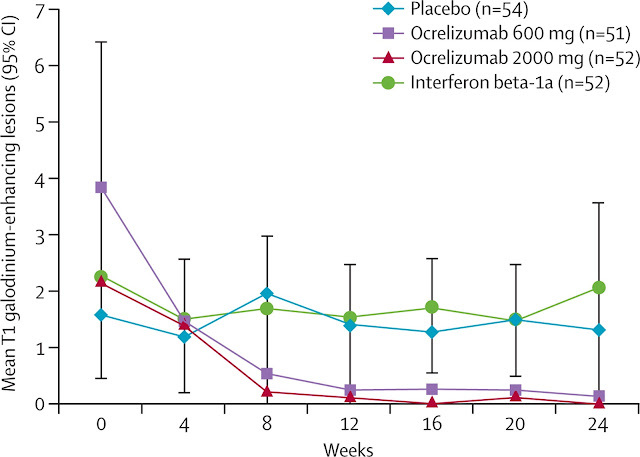 Ocrelizumab was studied in two identically designed phase 3 trials, OPERA I and OPERA II, which compared an intravenous infusion of ocrelizumab every 6 months with subcutaneous interferon beta-1a given three times per week. The primary outcome measure in these double-blind, double-dummy trials was annualized relapse rate, with secondary endpoints including sustained disability progression and MRI measures of disease activity. At the conclusion of the 96-week study period, annualized relapse rate in the ocrelizumab-treated patients was reduced by 46% compared with patients treated with interferon beta-1a. The absolute annualized relapse rate was 0.156 in the ocrelizumab arms. The risk for confirmed disability progression was reduced by 40% among ocrelizumab-treated patients, which was also statistically significant. Perhaps the most stunning result was the 95% reduction in gadolinium-enhancing MRI lesions seen in the ocrelizumab-treated patients. This is all the more impressive considering that the OPERA trials were head-to-head comparisons with interferon beta, which is known for its efficacy on MRI markers of inflammatory disease activity. Regarding safety, infusion reactions were seen in approximately one third of patients; however, the great majority of them were mild or moderate. There were no fatal adverse events attributable to ocrelizumab, and no cases of progressive multifocal leukoencephalopathy were reported. Ocrelizumab was also studied in the phase 3 ORATORIO trial, conducted in patients with primary progressive MS (PPMS). Unlike the OPERA trials in RRMS where ocrelizumab was compared with interferon beta, ORATORIO was a double-blind, placebo-controlled trial, as there is currently no approved standard-of-care therapy for PPMS. As is characteristic of the PPMS population, patients enrolled in ORATORIO were older than those in the OPERA trials (ie, mean age of 44 years vs 37 years), and approximately half were male. The primary endpoint of 12-week confirmed disability progression was reduced by 24% in the ocrelizumab group, which was the first time a statistically significant result has been achieved in a phase 3 trial of a drug for PPMS. Additional outcomes, including the prevention of new T2 lesions and the slowing of brain volume loss, were positive favoring ocrelizumab. Regarding safety, approximately a dozen malignancies affecting disparate organ systems were seen in the ocrelizumab-treated patients, which was a greater number than observed in patients receiving placebo. As in the RRMS trials, no cases of progressive multifocal leukoencephalopathy were observed. Because the ORATORIO trial was presented at the "late breaking" session, a complete analysis of the safety profile remains to be performed. Overall, the data for ocrelizumab demonstrated superiority over an active comparator in RRMS with a potent effect on inflammatory disease activity and resulted in the first statistically significant reduction in the risk for disability accumulation in PPMS. With what appears to be a largely favorable safety profile, ocrelizumab was a much-discussed topic at ECTRIMS, considering that this agent could alter the approach to MS disease modification across a broad range of disease course manifestations.